Want to earn more leads and revenue online? Content marketing is one of the best strategies for reaching new customers. With content marketing, you can provide helpful information about your company, products, and services, and develop relationships with potential customers that encourage them to purchase. On this page, we’ll take a look at four content strategies you can use and offer some tips to help you get started. If you want to learn more about creating a content marketing strategy for your business, call us today at 888-601-5359 to speak with a specialist. When you think of content marketing, what comes to mind first? For many people, content creation means blogging. Content, however, is not all about blogging. From infographics to video creation, there are numerous options available for content marketing. The crux of content marketing is that it contains information that users find valuable. Consumers are constantly seeking out information to answer their questions or help them understand a particular topic. When you share your knowledge, you are providing them with the information they need. If you decide to create content, it needs to be specific to your industry. After all, you want people to use your services or buy your products. The best way to draw them in is by creating content that relates to your industry and offerings. When you create your content, you need to know who will be reading it and the issues they are facing so that you can tailor the content to your audience and their needs. It is also important that your content is unique. There are many other businesses like yours that are creating content. In order to keep readers interested in your business, you need to make sure that your content has something valuable to offer. Many businesses are already using content marketing. In fact, 48% of small organizations use content marketing, while 41% of large organizations have a content marketing strategy. Of the companies that aren’t using content marketing, many of them are on the path to beginning their strategy. It’s never too late to start creating a content marketing strategy. At WebFX, we have a team of 150+ experts dedicated to your campaigns. And we can help you create a unique content marketing strategy. Your business will experience many benefits from content marketing. Let’s take a look at six of the top advantages of using content marketing. Content brings new leads to your website. Potential customers seek out information, and your content provides the answers they need. It’s the first step to getting people on your website. This type of marketing generates 3x more leads than traditional marketing, so it’s an extremely effective way to get people interested in your business. It’s important to build your brand recognition with consumers. You want them to know about your company and what it represents. People may visit your site, but not convert right away. After they leave, you want them to remember your brand in the future when they need your products or services. Content helps you build brand awareness. By checking out your content, visitors will become familiar with your brand and what you offer. This will help them recognize your business later when they need your services. Your budget is important. When you invest in marketing services, you want to use methods that are budget-friendly and effective for reaching your target market. Content marketing is very cost-effective. If you decide to do content marketing on your own, the cost will come down to the materials you need to make your content (e.g. video camera, a subscription to a design program, etc.). The biggest cost of content marketing is time. It takes time to develop quality content that keeps users engaged. If you don’t have time to develop quality content, you can work with an internet marketing company to create custom content for your business. Businesses that use content marketing are 6x more likely to get conversions than businesses that don’t create content. This method has such a big impact on conversions because it provides users with valuable information. It makes them feel more equipped and better prepared to make a decision. And it helps them feel confident in their decision to choose your company. One method that businesses use to reach more customers is search engine optimization (SEO). SEO is the process of boosting your website’s ranking so more users can find your website online. As you create content to address keywords related to your business, you have the potential to appear higher in search results for industry terms and phrases. And the higher you appear in search results, the more people will be able to find and contact your business. In addition, content provides you with opportunities to link to other pages on your site. You can guide your traffic to key pages on your site that provide them with more information about your offerings and encourage them to purchase. Content marketing helps you build trust with potential customers. It helps consumers gain a better understanding of your business and the products and services you offer. And you can show them that you are knowledgeable and willing to help them succeed. In addition, content marketing also helps them see the quality of your products. By using videos, photos, and other materials, you can give them an inside look at your company and provide the information they need to become customers. When you build trust with consumers, they are more likely to use your business. They will appreciate your openness, honesty, and willingness to provide them with helpful information. Blogs are the most common form of content creation. Your blog is a medium that allows you to post articles about topics related to your business. There are numerous types of articles you can create. For example, you can create how-to posts, list posts, checklists, and other helpful resources. When you begin creating content, you need a solid understanding of your target audience. Your audience will determine what kind of content you write. You can use Google Analytics to determine the most popular content on your site. This will help you see which types of posts your audience visits and engages with the most. If you find your audience responds well to list posts, you may add more of them to your content strategy. When brainstorming topics to write about, it’s best to create a running list of topics you know work well. The length of your articles will be determined by your goals. Posts with 1,000-1,500 words are good for getting shares on social media. Articles shorter than 1,000 words are mostly focused on generating discussion and getting likes. 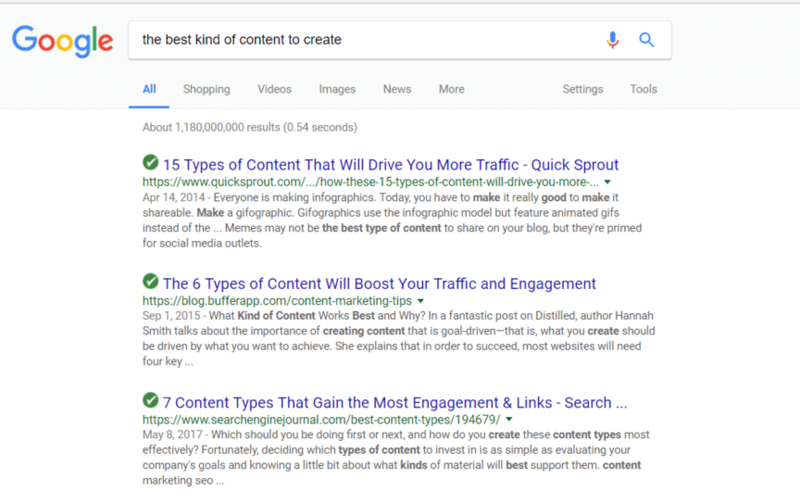 If you want to create content for ranking on Google, articles that are over 2,000 words are best. The highest ranking articles on Google are around 2,450 words. Break your content into small paragraphs. Most readers will skim your posts. Breaking your content into paragraphs with 3-4 sentences will keep them engaged and interested. Use “we”. Don’t refer to your own business in third person. Instead of saying “WebFX has experience in content marketing,” you would say “We have experience in content marketing.” This builds a connection with your audience and makes it feel as though you are personally talking to them. Use visual elements. You don’t want your blog posts to be all words. To keep readers engaged, you’ll want to add visual elements to your post. Content with visuals gets 94% more views than text-only content. Be consistent. Blogging requires consistency. Companies that create 16+ blog posts per month generate 4.5x more leads than companies that only publish up to four blog posts per month. It is important to write blog posts frequently throughout the month in order to see better results. If you aren’t sure where to publish your content, there are numerous blogging sites available. WordPress is one of the most popular sites to use for blogging. It is user-friendly and can be integrated into your website. Not sure how to start your blog? Check out our beginner’s guide to creating your first business blog! Video marketing is quickly becoming one of the most popular forms of content marketing. With the development of sites like YouTube, videos are becoming an integral part of people’s everyday lives. In fact, 63% of Internet users regularly watch YouTube videos. With the increasing popularity of videos, many marketers are turning to video marketing as a primary means of content marketing. In fact, 61% of businesses currently use video marketing in their content planning. This is expected to increase as the demand for videos increases. Video marketing encompasses filming, editing, and sharing videos to attract attention to your business. Like your blog posts, the videos you create should relate to your industry. Testimonials. It’s great to create videos of people saying positive things about your business. It provides social proof to viewers that real people are backing up your company, products, and services. Tours of your facilities. Tour videos are a great way to give potential customers an inside look at your business. These videos are especially helpful if you are trying to entice people to come to your place of business. Employees. If someone is going to use your company, they want to know the staff is knowledgeable and friendly. Employee spotlight videos are a great way to showcase your employees. Highlight products and services. These videos are meant to show people why they should buy your products by showing them how they are made and how they work. You can also answer frequently asked questions about your offerings to provide people with the information they need to purchase. How-to videos. These are popular videos to make, especially if you are in a service industry. You can show people how to do things on their own, like fix a leaking pipe or change a flat tire. There are many other available options for creating videos. This is a medium that enables you to get creative and produce content that will engage viewers. It takes time to create an engaging, high-quality video, but the benefits are well worth it. Video content helps engage readers and keep them on your pages longer. When they spend more time on your website, it sends a positive signal to Google. If Google sees that people are spending more time on your website, they will boost your website’s ranking in search results for certain keywords. This helps more people find your website. Videos are versatile too. You don’t have to limit your videos to content marketing. You can use videos for other marketing methods such as pay-per-click (PPC) advertisements. People are more likely to click on your advertisement if it is a video rather than an all text ad. Videos are a great addition to your site as well. Adding videos to your site pages improves conversion rates by 86%. Video marketing is one of the best ways to draw in customers. It takes time, but the benefits are well worth the effort. If you want to reap the benefits of video marketing but don’t have the time to dedicate to it, contact us online to see how we can help you create videos that will draw users to your site! Infographics are a visual and engaging way to present information to users. These graphics tend to have statistics or facts about a certain topic, and they include visual elements to engage users. Instead of presenting all the information in text, many businesses will create infographics. Not only does this help compile all the statistical information in one place, but it helps users understand the information better. When you use infographics, you help readers see the most important information in a visual way that catches their attention. This can drive users to read your article if they find interesting information in your infographic. Infographics are also great for sharing. You can share them on your website or social media. These graphics are often reused by other companies to publish on their sites. When authority sites share your infographics, it boosts the authority of your own site and increases your search engine ranking. The shareable nature of infographics helps expand your reach. You get credit for creating the infographic, which directs traffic back to your website. It’s a great way to attract new leads to your website. Guides and ebooks are a great way to give users their own copy of your content. These are pieces that you can post on your site, but many companies will require an email sign up to garner contact information from interested parties. These guides tend to be longer and more in-depth than content articles. Many of your articles will merely scratch the surface of your topics because you want to get users interested. Guides will give them more information if they are interested. When you create guides, you want to make it so that people have to sign up to get them. For example, you can create a simple sign-up form and require people to enter their names and email addresses to download the content. By requiring people to enter their emails to download your guides, you’ll boost your subscriber list and add some credible leads for your business. If you’re ready to start creating your content, there are a few things you should keep in mind. These tips will help you make the most of your content marketing plan. Since content requires consistency, you’ll need to have a list of fresh ideas. As stated previously, you should keep a running list of topics you want to cover. Take the time to brainstorm some ideas at least once a week. You can add them to your list and decide if you can write about them. Don’t be afraid to ask some of your teammates if they have any ideas. You may find you have topics, but aren’t sure about the direction to take. Our blog idea generator can help you select winning topic ideas for your content. Before you start writing, you need to be sure that you know your target market. These are the people you are trying to reach. You want your content to be pertinent to them. So, how do you figure out your target market? You’ll want to look at your current customer base. This is a good indication of who is in your target market. You can also create customer profiles. These are people you think would be most interested in your products or services. This will help you get an idea of people who are in your target market. It is important that you establish your target market so you can create the most suitable content. If your market enjoys videos, you’ll want to focus on videos rather than informational guides. Knowing your target market will help you figure out which strategies are best for your business. When creating content, you need to include visual elements. Don’t use stock photos or other generic photos. Add visual elements that add value to your writing and enhance it. If you’re writing a blog about how to change a tire, adding a stock photo of a tire won’t add value to your content. A picture of where to place the jack when changing your tire would be helpful. This will add value to your content because it is helping people understand your content better. Content with visual elements performs 94% better than all-text content. Visual elements keep people more engaged and interested in your content. If you’re making videos, keep them engaging too. You want to change up the frames and keep things moving. Users don’t want to stare at a video that remains facing straight on and doesn’t change angles. Use eye-catching colors for your infographics. Bright colors will catch people’s attention. You want to make your content stand out so you can get users interested. You want people to share your content so you can expand your reach and gain new customers. Make sure your content can be easily shared by people who read it. Include social media buttons at the bottom of your pages so people can share it to their own pages. You can post it on your own social media pages so people can share it directly from you. This is where email marketing comes into the picture. If you are creating great content, you can send that content to your email subscribers. These are people who are already interested in your business. Content is a great way to re-engage with your email subscribers. You can send them valuable content that will remind them of your business and your services. And email marketing helps you develop relationships that encourage people to buy. If you have a great infographic or an interesting video, there are influencers out there that are interested in including it in their posts. You just have to find them. These influencers can share your content with their followers, which drives more people back to your website. You can gain more traffic by reaching out to influencers with your content. At WebFX, we offer custom influencer marketing plans that allow you to develop relationships with prominent influencers and encourage them to share your content. Content isn’t a once and done thing. You need to constantly create new content in order to be successful with it. Research shows that 60% of marketers create at least one piece of content each day. Many companies get into the habit of creating new content every day so they have plenty of content to publish. It is important to keep up with your content so you can bring in leads and get people engaged with your business. If you’re too busy running your business to create content, let WebFX help you out. We are a full-service digital marketing company that specializes in content creation. At WebFX, we know your business is unique. We won’t give you a cookie-cutter plan that is just like 100 other business’ plans. Your business is unique, so we create a unique content plan for you. We also know that your budget is important. With our transparent pricing, you’ll always know how much each of our services cost. We provide you with the information you need to you can make the best decision for your business. We are dedicated to helping your digital marketing efforts succeed. To date, we’ve driven over $700 million in sales and over 3 million leads for our clients. Our goal is to earn you the highest possible ROI from your digital marketing campaigns. We have over 350 testimonials from our clients that speak to the great work we do for your business. If you’re ready to start creating your content marketing strategy, contact us online or call us today at 888-601-5359 to speak with a specialist. Want a personalized content marketing strategy?